On the Northern Area Planning Meeting agenda for 22 November was an application to convert a 3-bed terraced house in Galahad Close to two flats. I requested this be brought to committee because of concerns expressed by neighbours who were worried about parking, overlooking and poor access to the conversion. Surprisingly Cllr North thought it was wrong to bring the matter to committee he thought the application was perfectly acceptable and should go ahead. The most bizarre comment in the debate came from Cllr Mrs Whiteley who also supported the application arguing there were no parking problems on King Arthur’s Way. She found plenty of spaces when driving around at 4:30pm. The committee went against officers’ recommendations and rejected the application on the grounds of poor access. I will be following up neighbours concerns regarding parking in the area with Testway Housing and Hampshire Highways. The October council meeting backed calls by Lib Dem councillor Alan Dowden to impose alcohol free zones on all the built up areas of the borough. Cllr Dowden raised the issue because of drink fuelled vandalism in Valley Park . Having seen at first hand similar problems particularly around the Smannell Road play area and on Cricketers Way I fully supported his proposals. Local residents should not have to put up with such behaviour and the police need every help we can give to combat it. The order which covers the whole of Andover now needs Home Office approval. At the October council meeting I asked two questions on Health and Safety regarding glass recycling bins and dustbin collections. The full text of the questions was as follows. In 2006 the Health and Safety Executive audited the council’s waste collection services. Within their report were two significant areas of concern. 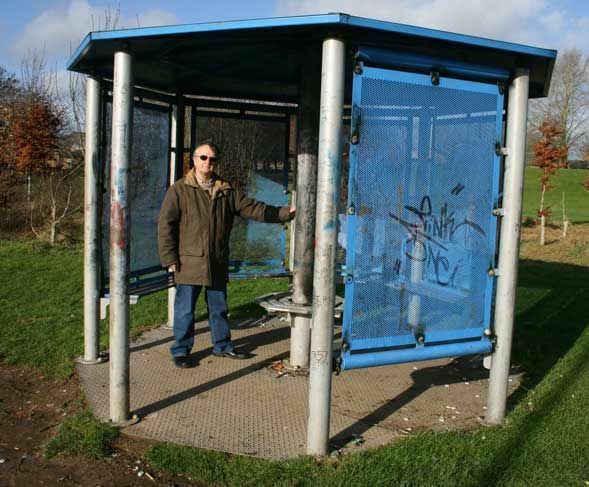 Firstly some glass bottle banks were located in inappropriate areas causing difficulties for staff and safety issues for users. Would the portfolio holder advise me whether this has been investigated and what corrective action has been taken, in particular with reference to the site at Landale Close, Enham Alamein, used by both vehicles and disabled pedestrians? Secondly: access difficulties on King Arthur’s Way, Andover made for unsafe working conditions for waste collection operatives when moving dustbins to vehicles. Would he advise what actions have been taken to minimise risks especially as the bin size has doubled since the introduction of ABC, in particular can he update me on the survey of this problem reported to the recent Commercial Services Joint Committee? The portfolio holder replied that there were no problems with the recycling bins in Enham and that he was still waiting for the report on the bin collections on King Arthur’s Way. I look forward to his response on this.